Was it a catch? Was it an interception? It was an interception, idiots. I can guarantee you that when you look back at Week 3 of the 2012 NFL season, you won’t remember the three overtime games. And you won’t recall the Steelers’ defense collapsing in Oakland. You may even forget about Torrey Smith’s brilliant performance on Sunday Night, just hours after his little brothers’ death. Just kidding about the Rodgers part. But, as the numbers show below, if he keeps this up, fantasy owners could be in trouble. Matthew Stafford completed almost 79% of his passes, the most in the NFL during Week 3. It was a good matchup, and if Stafford hadn’t gotten hurt, his fantasy numbers would’ve probably been higher. 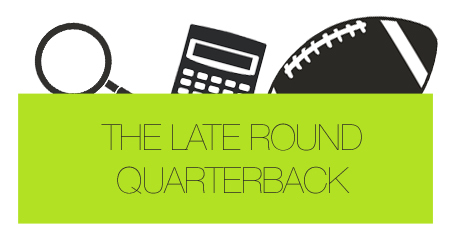 There were eight quarterbacks who threw for 300-plus yards this week. Just one of them, Tom Brady, was considered an early-round fantasy quarterback. I’m not hear to tell you how dumb you were for taking a quarterback early in your draft. I just think we’re finally seeing what I had mentioned in my book. The elite quarterbacks aren’t the only ones throwing more and getting better. All quarterbacks are. Of the top-seven Week 3 quarterbacks, three play in the AFC North. I thought this was a defensive division? I’ll credit this number, and the majority of AFC quarterback numbers, on matchups. I do think, however, that given the way the defenses in the AFC North have played, some of these passing statistics can continue. Jamaal Charles led all running backs in rushing yards and receiving yards. He had 233 rushing yards, and while Pierre Thomas also had the same number of receiving yards (55), I’ll just say it was Charles who led the league in receiving at running back. Really, it was just a matter of time before we saw this. Patient Jamaal Charles owners were rewarded with the highest fantasy total of the week. Andre Brown was the only running back who scored multiple rushing touchdowns. Is Ahmad Bradshaw’s job in jeopardy? I say he’s still the starter, but the Giants would be making a mistake if they didn’t continue to feed Brown. Kenny Britt received 11 targets. So did Kendall Wright. When I first saw Kenny Britt’s target total, I thought to myself, “Hey, maybe he’s back.” And then I realized Kendall Wright saw just as many, and it was a 44-point game by the Titans. Britt, in my eyes, isn’t an every week starter just yet. Mike Wallace, Antonio Brown and Heath Miller all received double-digit targets. As frustrating as Todd Haley’s offense is to Steeler fans, there are times where he’s allowed Ben to let loose. People are now seeing the kind of quarterback Roethlisberger can be, and his favorite targets are benefiting. In high-scoring games like the one against Oakland, Steeler targets are going to see the ball a lot. Greg Olsen led all tight ends in targets, and had the highest percentage of team targets in the entire league. It looks like the entire fantasy world gave up on him too quickly. Given the depth of the tight end position, I wouldn’t dub Greg Olsen a “must start”, but if you’re hurting at the position, look to get him off the waiver wire after a disgruntled owner dropped him last week. Torrey Smith and Golden Tate were the only wide receivers with multiple touchdowns. Kyle Rudolph and Heath Miller were the only tight ends to do so. We’re going to see this statistic more and more often, folks. With spread offenses, more receivers are touching the ball, and hence, less receivers are getting multiple scores. Gone are the days of plentiful true elite receivers. Teammates Calvin Johnson and Nate Burleson were the only two players in the NFL with double-digit receptions. Again, let’s credit this to the high-scoring affair. But one thing to point out is that Nate Burleson looks to still be getting WR2 targets in that offense. That doesn’t bode well for Titus Young owners. Ben Roethlisberger had more fantasy points than Aaron Rodgers and Drew Brees combined. Aaron Rodgers’ lack of fantasy success this year, I believe, can be attributed to some tough defensive matchups. As for Brees? Well, he’s actually ranked 4th among quarterbacks in standard scoring, but I don’t think we’ll see the same kind of quarterback as we did last year. Four Bengals’ receivers had 60-plus yard games. These Bengals include: AJ Green, Andrew Hawkins, Armon Binns and Jermaine Gresham. Make sure to start as many players against the Redskins defense as possible. They’re dreadful. Golden Tate was 6th in the NFL in percentage of team targets. Had to throw this in just because. Cam Newton was the only quarterback to throw more than 2 interceptions. I still think he’s a worthwhile fantasy start, but again, you can’t expect the same numbers as last year. Sensing a theme? Aaron Rodgers was sacked 8 times. Ben Roethlisberger was sacked once. Clearly this is due to matchup, but if there’s one thing Rodgers’ owners need to worry about, it’s the pass protection. Phew did it look bad last night. Shaun Hill threw 13 passes and had more fantasy points than Aaron Rodgers, Cam Newton and Michael Vick. I’m sure this stat made some early-round quarterbackers vomit in their mouth. Larry Fitzgerald caught all 9 passes thrown his way. I wrote about Fitz yesterday, and wish I would’ve believed in him. Look for more sporadic play from the Cardinals’ receiver. Dwayne Bowe is second in the NFL in targets. Just throwing this one out there. Matt Cassel is looking for Bowe…a lot. While we want to blame Chris Johnson’s numbers solely on Chris Johnson, we have to remember that he’s not getting the same number of touches most 3-down backs are getting. Although, on the flip side, Chris Johnson has 45 rushing yards. Andre Brown has 139 yards with the same number of attempts. Michael Bush is one of five running backs with 3 or more rushing touchdowns. Starting this week helped, as did his two-touchdown Week 1 performance. I still stand by Bush being nothing more than a flex play with Forte in, and you should pray for a touchdown if you start him. Steve Johnson, Julio Jones and Mike Wallace are the only wide receivers with 3 or more receiving touchdowns. If I told you this stat before the season started, not many would raise their eyebrows. The consistency at wide receiver from pre-season ranks to current ones has been better than most years thus far. Carson Palmer is second in the NFL in pass attempts. I told many that Palmer would be a great late-round quarterback because he’d get a lot of garbage yards. The Raiders’ defense is pretty horrendous, and Palmer has better weapons than many NFL quarterbacks. Heath Miller and Vernon Davis have 4 touchdowns. No wide receiver has 4 touchdowns. Vernon Davis isn’t all that much of a surprise, but Roethlisberger’s tendency to find Heath in the red zone is important to Miller’s fantasy value. In fact, Heath is located so much in the red zone, that 27% of his catches have been touchdowns this season. In standard leagues, Andre Brown is the 8th ranked running back. He’s looked good, but his value is going to decrease dramatically when Bradshaw comes back. Lance Moore has had a non-decimal fantasy score each of his first three weeks. The most important number of all! Lance Moore has had whole number yardage totals (120, 30, 70) over the first three weeks. Quick – go to Vegas! Bet on 60 for next week!